There’s something wonderful about Mary St that keeps us coming back time and time again. 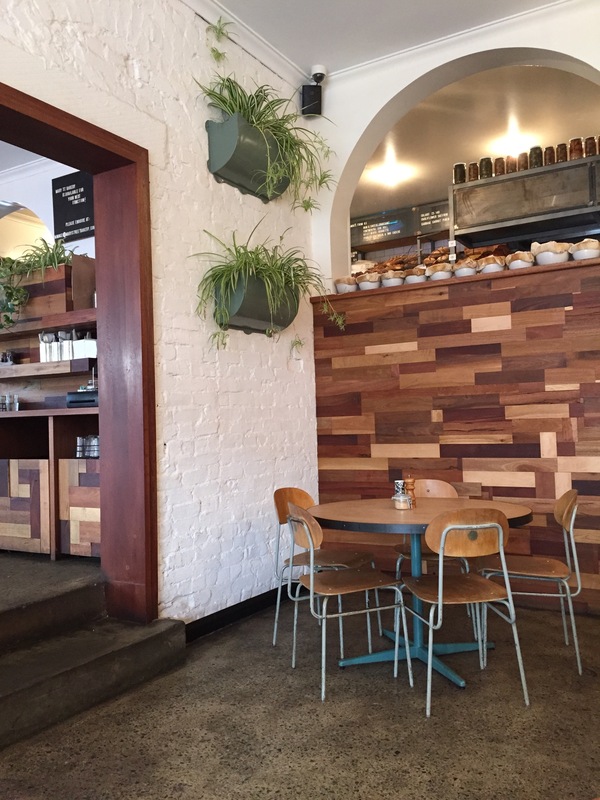 It could be the retro wood tones, open roof or that smell of baked goods, or maybe it’s because we never seem to run out of things on the menu to try which necessitates returning all over again. Whatever it is, we can’t get enough. As always we started with a Pound coffee from the local roastery that we keep meaning to visit but never get around too (we will one day guys). 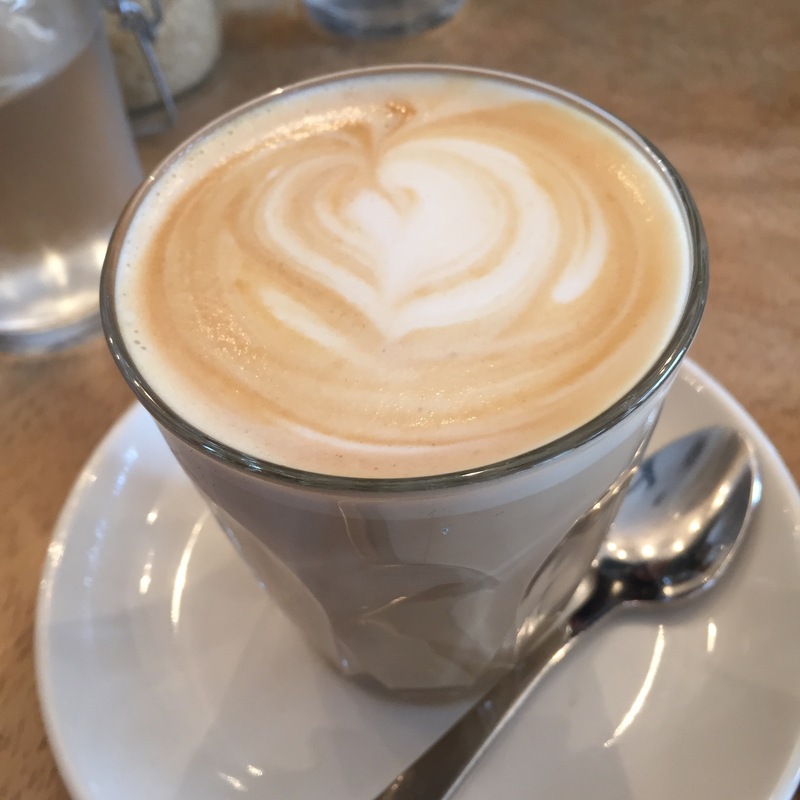 Our coffee had a nice flavour, was served at drinking temperature with creamy milk but was a little weak for our tastes. 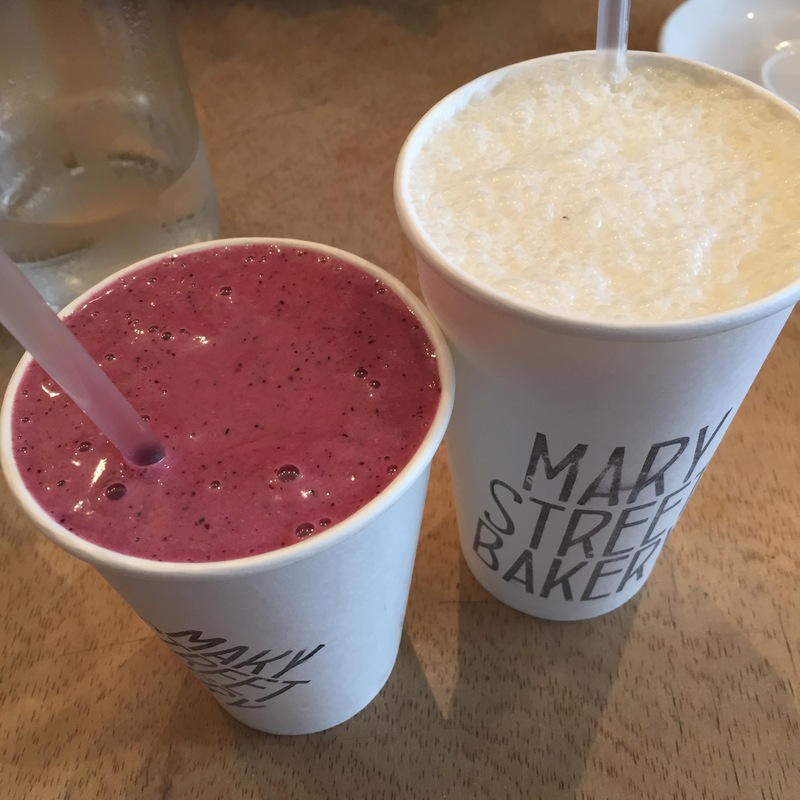 For something a little different we went for a malt milkshake and a smoothie with berry, banana and citrus. We weren’t impressed that they were served in take away cups to dine in, but one sip of the frothy malt milkshake made us forget it all. It was like what I would imagine could be found in a diner in the 50’s, I can only imagine what pleasant memories it was conjure up for someone who lived through it. The smoothie was a very eclectic drink, almost like one you would make at home where you chucked in everything on hand to see what it tasted like. Unlike those experiments though this one somehow works, delicious, fruity and thick with a bright colour from the berries. We would happily order both drinks again. Our first dish to arrive was the veggie baked eggs. We absolutely loved the surprising crunch of the chickpea, adding an interesting texture to an already rich and bold dish. 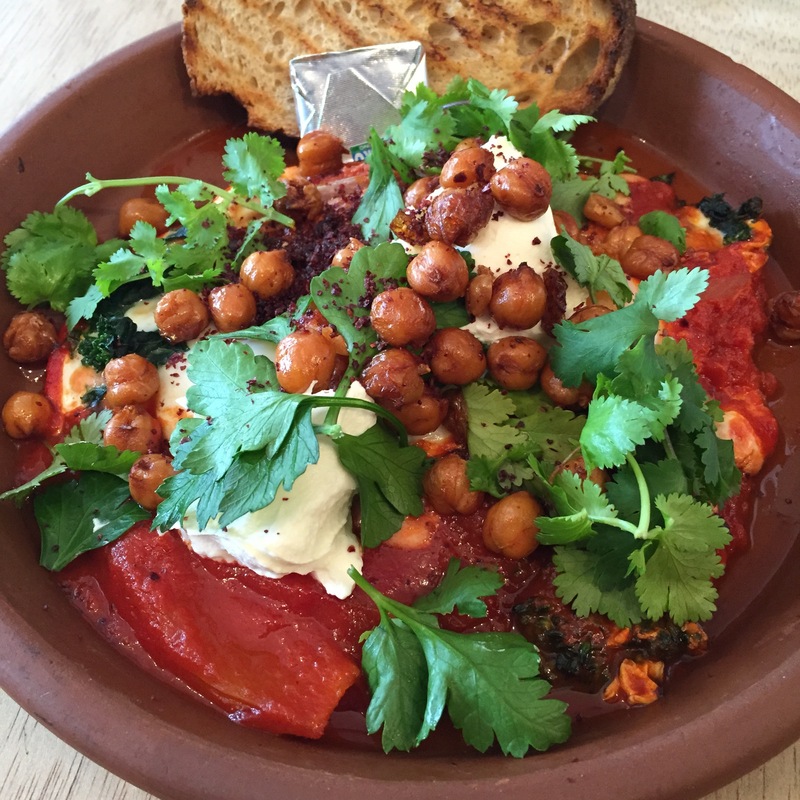 We usually go for the carnivore chorizo baked eggs options but this dish shows us what you can achieve without it. For our sweet dish we went with the gingerbread with mascarpone, banana and strawberry. Both the fruits were ripe and fresh with lots of flavour, while the mascarpone was creamy and smooth. The gingerbread wasn’t too gingery, which works as it can so often overwhelm, and acted as a base to bring it all together. 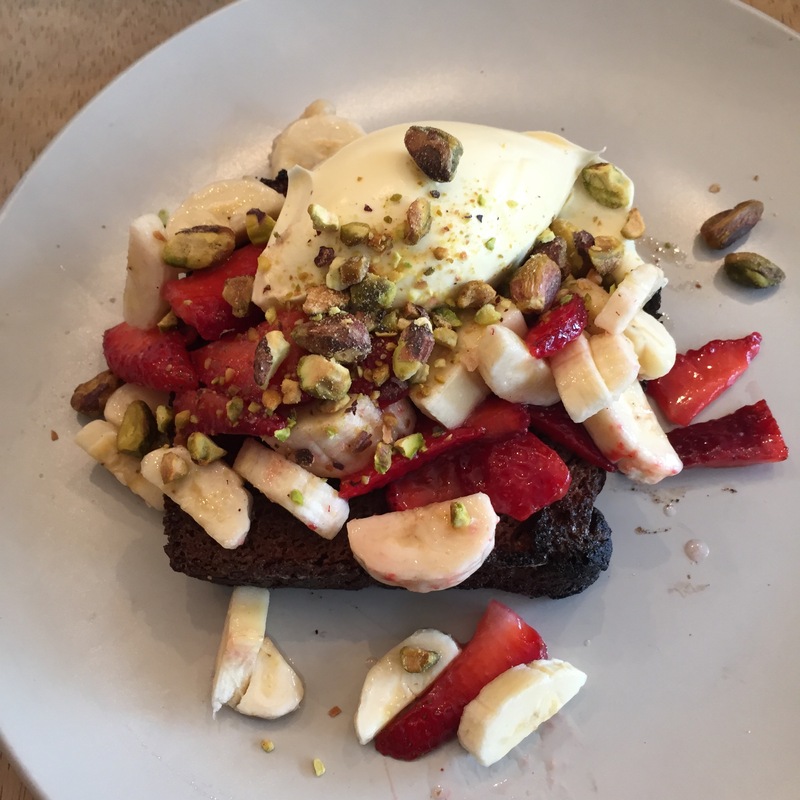 The bread was moist and warm, making the toppings go a bit gooey, just how we like it. If you like sweet sides and want something a little different, this dish is for you! I don’t think we’ll ever stop coming back here. They don’t do the most complex of dishes, but they’re interesting, always well executed and the flavours just work!